What is the fondest memory you have of your aunt? If you are fortunate enough to have an aunt in the family you can very well relate to how awesome they truly are. You may also be thinking about a special person who might not be your biological aunt or aunt by marriage but this person carries the role of an amazing aunt like a champion just the same. These individuals should be celebrated at every opportunity. Aunts are often like a second mom, nurturing and unyielding but without the sometimes bothersome tone of an immediate parent. They have your best interests at heart and will go to the moon and back to ensure you are supported but self sufficient when making decisions, overcoming milestones and whenever you turn to them for advice in general. Let’s take a minute to think about all of the times our aunts have helped us out, brought us joy, kept a secret, came to the rescue and so much more. With these moments in your mind, consider words that could be personalized to demonstrate the gratitude in your heart. Here are a few suggestions below. (30th) Happy 30th birthday Aunt [NAME]. May this day be filled with the same happiness that you bring to us all. (40th) Today marks your 40th birthday auntie! Of all the people I know you are among the most witty and memorable. So today, I want to remember you and wish you peace and blessings on your special day. (50th) Wow, Auntie, what a milestone! You have made it to the big 50! Instead of thinking about getting older, think about the fifty wonderful years you have spent loving, teaching nurturing and being a positive figure to the people you have came across. You are truly a gift to us all. Happy birthday. (60th – Funny) Happy birthday aunt [NAME].Time does not seem to stand still for a minute and I am so surprised that you don’t ever seem to stand still either at that age. Happy birthday! (From Nephew) Aunt [NAME], I am taking some time out to say happy birthday. There have been so many moments where you have shown me what it looks like to live life to the max and I’m so happy to see you celebrate another year. With love, your nephew [NAME]. (From Nephew – Funny) Hey Aunt [NAME]. I won’t make any of my siblings jealous by sharing the big family secret. Don’t you remember the secret about how I am you favorite nephew?. Happy birthday. (General) Aunt [NAME], it is bitter sweet sharing in celebration as you reach another year of life. Happy birthday! 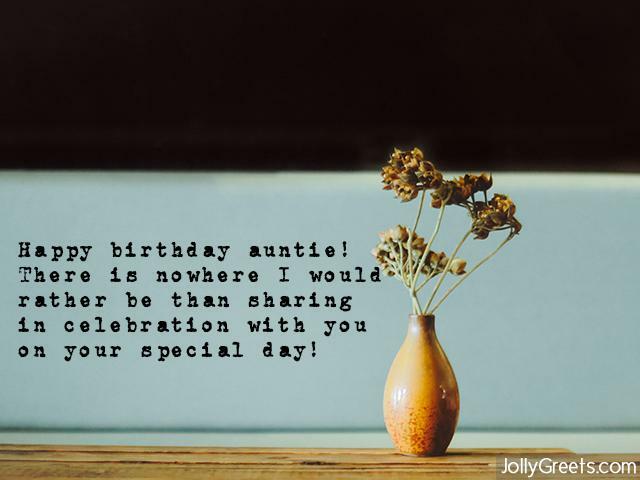 (Long Distance) Auntie, I am sending you lots of birthday love from afar. I wish I could be with you to celebrate today but I know that you are celebrated often and I hope to see you again soon. (From All of Us) We all wanted to send out very special birthday wishes to you on your birthday. You are tailer-made just for our family. (From All of Us) Happy birthday aunt [NAME]. All of us wanted to take a moment to share our love for you on this day. You are one of the pillars of the family. We love you and hope your day is filled with joy. (Distant Relationship) Aunt [NAME], I have desired to reach out to you for some time now and your birthday is the perfect opportunity to do so. May this day be the start of new beginnings in your life and in our relationship with one another. 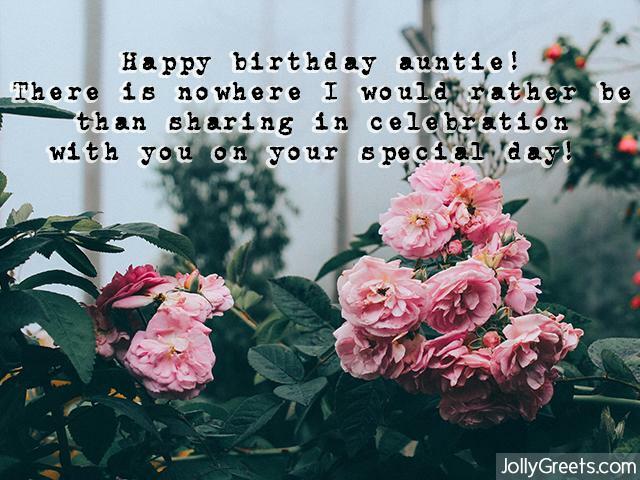 (Twin – Funny) Aunt [NAME], have you caught on to me giving you and my mom the exact same thing every year on your birthday for all of these years? Well that’s what happens when it becomes double the trouble gift shopping for you two. Happy birthday! (Young Aunt – Funny) It’s interesting have such a young, hip aunt. You are more like a friend sometimes and I mean that in the coolest way. Happy birthday. (In a Heaven) Of all the people I know you were among the most witty and memorable. So I am remembering you on your birthday today. I know you are watching and smiling from above. (In Heaven) This special day comes around each year but it does not be any easier with you gone. Happy birthday sweet aunt. (Religious) May the spirit of God uplift and retain you on your birthday. (Religious) Happy birthday aunt [NAME]. May your heart be filled with the joy of the Lord on this day and everyday. (Like Mom) Aunt [NAME]. You are like a second mom to me and I just couldn’t wait to share, like so many others, the love and appreciation we all have for you on your special day. Happy birthday! (Like Mom) You took me in and raised me like one of your own. I am so happy to have you aunt [NAME]. Happy birthday! (General) Happy birthday auntie! There is nowhere I would rather be than sharing in celebration with you on your special day! 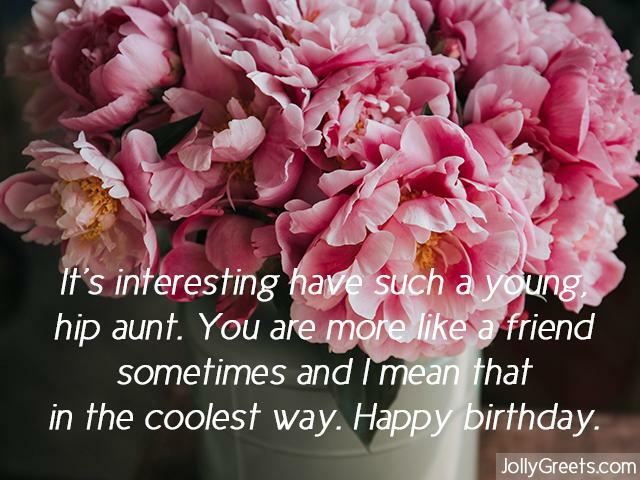 (General – Funny) You are another year older, another year cooler and another year closer to being my all time favorite aunt out of the bunch! Happy birthday. (General- Funny) Happy birthday aunt [NAME]. I am only sending birthday wishes because I know I will never hear the end of it from you if I don’t. Haha, just kidding happy birthday. Aunts have a unique way of providing a delicate balance between a friend and an authority figure. They gently push us in the right direction, make us smile and try their best to keep us out of trouble. No matter the type of relationship aunts are a privilege and deserve to be appreciated.